Innerchoice Publishing Blog – Page 3 – Bringing Emotional Intelligence to Life. Today’s blog was inspired when I was sharing a meal the other day with a teacher friend. I asked how the new school year was starting out, and she shared that a challenge was getting the students to be kind to one another. I thought that providing a kindness activity today seemed the perfect response. Everyone intuitively knows the value of being kind, and teaching kindness and empathy to children. Observing or participating in acts of kindness sets a positive and caring tone for the day as well as reinforces important social-emotional skills. Modeling and reinforcing kindness makes it a practical and commonplace skill. Many benefits have been reported in support of directly teaching kindness in schools including: Happy caring children; Greater sense of belonging and improved self-esteem; Improved health and less stress; increased feelings of gratitude; Better concentration; Reduced depression; Less bullying. In a 2016 report the US Department of Education said that research demonstrates the importance of kindness: “Students learn best when they feel safe, supported, challenged and accepted”. These are all elements of kindess. This week’s activity helps students learn about the richness found in kind acts and behaviors and how they can be a benefit to all aspects of their lives. The activity, A Book of Kindness, comes from the resource guide, Caring and Capable Kids. Welcoming families as vital partners in the school community can create a stimulating learning environment. It can also be frustrating and challenging, especially when social customs and mores, language differences, even fear become barriers that can hinder this partnership. In many cases, immigrant students prove surprisingly resilient and eager to mimic the behaviors and values of their American peers. Some come from countries where Western culture has already made significant inroads, whether through television, movies, music, technology or MacDonald’s. However, too rapid acculturation can often spell trouble at home, as conflicts develop between children intent on change and parents determined to preserve traditional values. This book is about reaching out to immigrant parents because it is often the parents, not the students, who need the greatest understanding and help. School systems differ around the world. In many countries parent involvement is not expected, or wanted. Immigrant parents may not understand how the U.S. school system works and be totally unfamiliar with the concept of parent involvement. In addition to not understanding the school system they often have very little knowledge of how to support their children’s educational development. Few children, regardless of culture, achieve their full academic, social and leadership potential without the support of a caring, involved family. Talented, able immigrant children can easily fall by the wayside if their parents are so alienated from the educational system that they are unable to assist with homework, language acquisition, and a whole array of compliance issues ranging from simple attendance to behavior codes and discipline policies. When parents are in overt (or covert) conflict with the educational system, the cultural tug-of-war for the mind and heart of the child can be devastating. By extending a welcoming hand, making efforts to communicate, and involving immigrant parents in the schooling of their children, we can circumvent many of these problems. It’s a preventive approach, really, one that attempts to support and strengthen the child at the foundational level. As educators, we need to comprehend and address a complete range of cultural issues. To do this, we have to understand the values, customs and worldview of the dominant American culture as well as those of immigrant students and their families. We must be aware of the unique behaviors of each immigrant child, while appreciating and understanding the cultural context from which these behaviors originate. We should also try to understand the immigration experience and the process of acculturation — which is often painful and conflicting. Understanding your own culture is a major step toward understanding others. It’s like anything else. Having a context and a basis for comparison makes identifying differences a lot easier. Remember that while values are the bedrock of culture, they often can only be understood by examining customs, communication styles and individual behaviors. The values themselves are hidden. Communication styles and patterns, including body language, vary from one culture to another. For example, people from some cultures pull away in response to direct questioning or see “why” questions as accusations. Others feel an obligation to please the person with whom they are talking and think nothing of massaging the facts in order to do so. In some cultures, smiling and nodding have little to do with genuine pleasure or agreement. In others, having direct eye contact with someone in an authority position is considered rude. In communicating with immigrant students and their families, it is important to do perception checks. Is your interpretation correct? Check with the other person. The rules for good listening and responding don’t change, but if you are willing and able to make small adjustments in your style of communicating (to more closely mirror the style of the other person), communication will be improved. • How time is viewed. Does the American expectation of punctuality have meaning in the other culture? Is the fast pace of American life creating conflicts for the student or family? Do children and their parents understand and accept the concept of deadlines and due dates for projects and papers? • The family’s decision-making process. How does information seem to flow from the child to the home and back again to you? Is there an established protocol for gaining parent cooperation? Do family members other than parents (e.g., grandparents, aunts, siblings) need to be involved? Gauge the amount of information you provide. This is particularly important when working with immigrant parents. Individuals experiencing culture shock are already overwhelmed. Piling on reams of information is probably going to be counterproductive. Prioritize what you need to convey to parents and then deal with it in small chunks. Have more contacts of shorter duration. Never neglect or take for granted the emotional life of your students. Feelings, self-awareness, life skills, conflict management, self-esteem, and all of the other developmental areas now identified as social emotional learning are critically important. An impressive array of research from multiple fields supports the validity of time and energy spent by educators in these domains. Emotions are not unruly remnants of stone-age survival to be hushed and otherwise ignored while we develop cognitive skills. Emotions drive our behavior, shape our values, and predispose us to choose one course of action over others. Emotional and rational skills are equally important interdependent components of human intelligence. Here’s Your Monday Morning Sharing Circle. Gather everyone into a circle. Explain the rules for sharing, and get agreement from everyone that they will follow the rules. • Everyone gets a turn to share, including the leader. • You can skip your turn if you wish. • Listen to the person who is sharing. • There are no interruptions, probing, put-downs, or gossip. • Share the time equally. Get more in-depth information here. In virtually every area of living life skills are needed. Along with math, science, technology, history and English, students also need to be taught how to manage themselves, their time and activities. They need to know how to get along with others and to formulate goals and communicate their needs in a pro-social manner. Too often these critical life skills are not addressed in a direct fashion but their acquisition is simply left to chance. Students often don’t learn effective ways to deal with life issues. They have ideas but can’t express them clearly. They get into conflicts they don’t know how to resolve. They have hopes and dreams but can only drift through life. Often it’s the lack of skills and awarenesses that prevent many from becoming fully capable, contributing, happy members of society. School is the ideal places to directly teach life skills, both for their impact on the future and because life skills ensure the effective application of academic skills today. In addition to your own enabling behaviors and the cultivation of an affirming classroom or counseling environment, you can assure a positive impact on the social-emotional development of your students by infusing these activities into your regular curriculum or counseling efforts. They represent one of many possible approaches and can be enlisted as supplements to other strategies you are currently using. UNDERSTANDING ME is packed with meaningful information for teens to learn new ideas, attitudes, behaviors, perspectives, and skills while promoting self-awareness and self-esteem. These flexible worksheets can be used by anyone working with teens – teachers, counselors, youth group and after-school leaders, home-schoolers, and parents. Today’s selected student activity is entitled Pressure!. What is Peer Pressure and what do you do with it? Use this activity now, and purchase the book to have a whole library of instantly usable social skills skills activities with which to engage your students. You can check the book out HERE, and you can open a reproducible PDF of your student activity HERE. 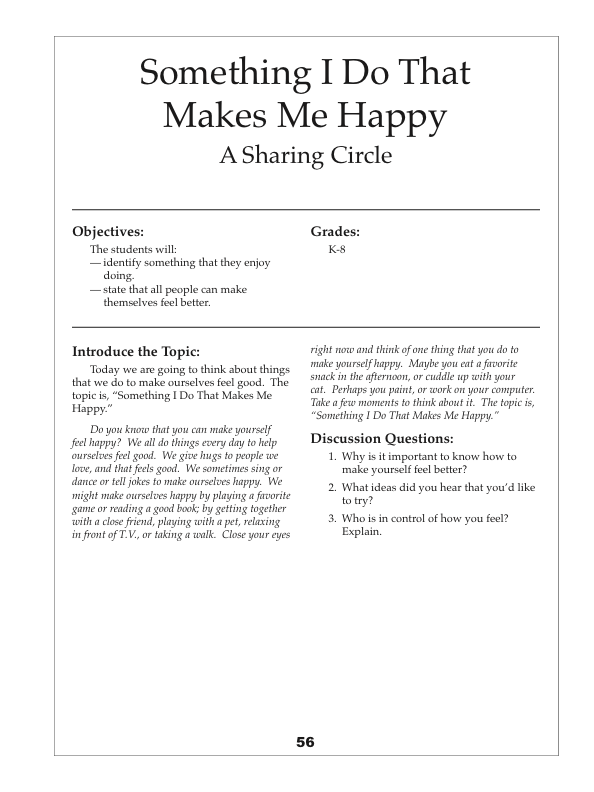 This Sharing Circle topic comes from the grades K-8 resource book, TEACHING THE SKILLS OF CONFLICT RESOLUTION. — identify something that they enjoy doing. — state that all people can make themselves feel better. 1. Why is it important to know how to make yourself feel better? 2. What ideas did you hear that you’d like to try? 3. Who is in control of how you feel? Explain. PS: If a friend forwarded this to you, you can just sign up to get your own weekly Innerchoice Counselor Activity Blog. Everyone gets angry, and everyone gets involved in conflict. Both are normal human experiences and often one leads to the other. Anger can lead to conflict, and conflict can lead to anger. They generally go together and it’s hard to tell which came first anger or conflict. Indeed, it’s often difficult to tell them apart. It’s only natural then that the teaching of the skills and awarenesses that lead to the ability to effectively managing these powerful emotional events be taught together. Children need to learn effective ways to control, express, and release their anger and strategies for dealing with the conflicts that inevitably arise in life. Because so many influences in their lives teach otherwise, powerful approaches and consistent intervention are needed to teach children positive, social and emotional skills. Practice makes perfect. Repeated exposure to positive alternatives, consistent reinforcement, and practice. Lots of practice! Learning together in a classroom or counseling session makes it easier to internalize the skills, strategies, and methods of anger control and conflict management. We all are social beings designed by our long evolutionary history to learn our interactive behaviors with others. The activities in ANGER CONTROL AND CONFLICT MANAGEMENT FOR KIDS are designed to actively engage the students with each other in applying knowledge, solving problems, communicating, cooperating, and relating experiences to their own lives. They demonstrate to students the power of approaching anger and conflict with a win-win attitude, and to teach them a number of basic pro-social strategies for managing anger and resolving conflict. The experiential group activities included in this book examine the nature of anger and conflict as well as their causes, effects, and resolutions. A unique Sharing Circle and role-play process builds into the learning experience repeated opportunities for behavioral rehearsal. Today’s selected group activity is Learning to Control My Anger.